Guitar Hero or Urban Cowboy? Tired of battling the same old Guitar Hero shredders? Well, now you can go mano-a-mano against a buffalo-riding Ted Nugent in the next installment of Guitar Hero On Tour. Will civilization ever be the same? The Nuge was thrilled to lend his track Strangehold to the game, and even more so to be asked to be one of the digitized characters. "My son is a master at it," he reveals. "If he could play guitar like he plays Guitar Hero, he'd be in my band!" The Motor City Madman admits that his own Guitar Hero skills are less than hero-worthy, "I've tried to play it and I felt like a fumbling idiot." Still, he insists that he's going to work on his game skills, "just so I can jam with my son." 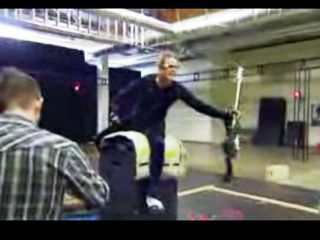 Like other real-life guitar heroes, Terrible Ted donned a motion sensor capture suit so game developers could recreate his onstage movements. When it came time to present Ted's buffalo-riding entrance, however, The Nuge straddled a less-than-threatening-looking dummy. "They tried to tell me what to do so they could capture my moves, but I ignored them. When the music starts playing, my body knows whats to do." Joining Nugent in the next Guitar Hero On Tour are pixelized versions of Jimi Hendrix, Ozzy Osbourne and Sting. Nugent says his presence will fit right in with such esteemed company. "My music is so pure. It's the grind factor, the groove factor, the rhythm and blues, all things soul." Check out Ted suited up and ready for his Guitar Hero On Tour debut in this video clip. In the coming weeks, MusicRadar will present a special podcast interview with Ted Nugent. Stay tuned!